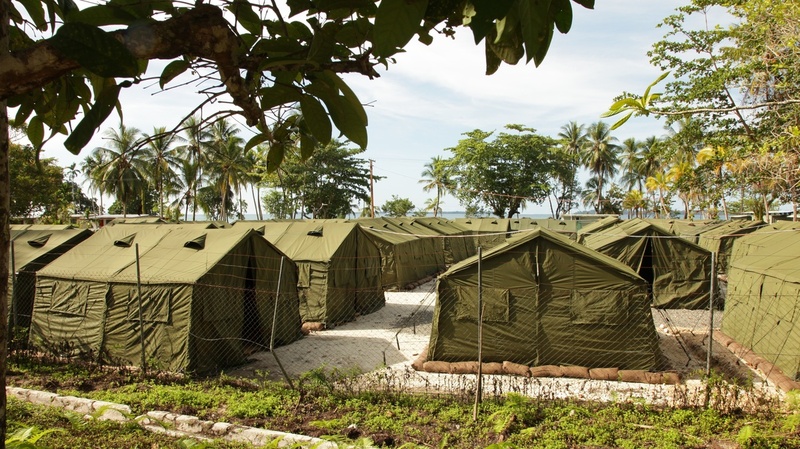 Australia, Papua New Guinea Agree To Close Refugee Detention Camp : The Two-Way The camp on Manus Island has been criticized by human rights advocates, and was declared unconstitutional by Papua New Guinea's Supreme Court. A view of facilities at the Manus Island Regional Processing Facility in Papua New Guinea in 2012. For years, the facility has been used to indefinitely detain asylum-seekers; Australia and Papua New Guinea have now agreed to close it. A widely criticized refugee detention camp on Manus Island will be shut down, Papua New Guinea and Australia announced Wednesday. They have not set a timetable for the closure or announced what will happen to the 850 men currently detained in the camp, The Associated Press reports. Australia's policy on migrants and refugees is strict: Asylum-seekers attempting to reach Australia by boat are intercepted at sea, and officials say they will never be allowed to settle in the country. That's true even if authorities determine them to be refugees who would qualify for asylum. Instead, arriving refugees and migrants are sent offshore to detention centers where they are held indefinitely. Eyewitnesses have reported appalling conditions at some of the detention facilities, with violence, abuse and pervasive psychological trauma. In February, Australia's highest court effectively upheld the detention policy, throwing out a legal challenge to offshore refugee detention centers. But in April, Papua New Guinea's Supreme Court took a different stance. That court said the detention of refugees on Manus Island is "unconstitutional and illegal," and that holding refugees as prisoners regardless of their circumstances "is to offend against their rights and freedoms." "It's extremely hot. There's no air conditioning. They live often in tents. It's difficult in terms of the confinement, but I think the real concern for people are the conditions, psychologically, that people go through in terms of being indefinitely detained. Some of these people have been in these camps for three, four, five years, and that leads to an enormous level of self-harm, suicide attempts." Australian Immigration Minister Peter Dutton says his country plans to relocate the detained asylum-seekers elsewhere in Papua New Guinea or else send them back to their countries of origin, the AP reports. Dutton says they will not be transferred back to Australia. The agreement with Papua New Guinea to shut down this facility only covers Manus Island. A second large, offshore detention center is located on the tiny island nation of Nauru. The Guardian has released a cache of more than 2,000 reports detailing allegations of assaults and horrific living conditions at the Nauru facility. More than half of the reports involve children. The allegations include sexual abuse assault of children and self-harm by children. Dutton played down the reports, as the Two-Way has reported, and when asked if Australia would demand an inquiry, said that Nauru is "not part of Australia."